Treat your loved one / family member / friend to a gift voucher with a difference. 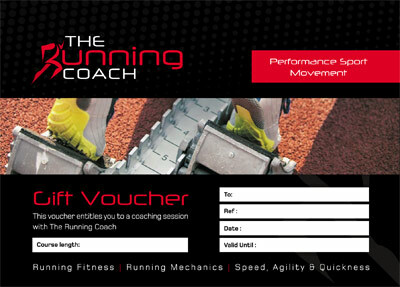 Vouchers are available to secure a 1:2:1 Technique Coaching session with The Running Coach. Tuition lasts approximately 2 hours. Session will be delivered at a Training Studio in Chesterfield, Derbyshire, S41. Want to book multiple coaching sessions with The Running Coach? Vouchers are available to secure 1:2:1 training sessions by the hour. Content includes strength development, drills, and exercises to improve running ability and technique.